WHAT: In honor of National Soup Month, Legal Sea Foods will be declaring a “Legal Holiday” on 1/11: Chowda Day. Available at all Legal Sea Foods’ locations nationwide for the duration of the day, $1 cups of their signature New England Clam Chowder will be served up as they have been at every Presidential inauguration since 1981. On 1/11, it makes perfect sense to share Legal’s #1 famous chowder for only $1 a cup. Legal Sea Foods also invites you to share the New England love by sending someone “warm wishes” through their online fish market. 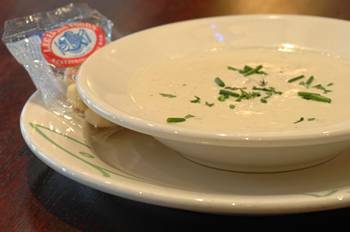 On “Chowda Day,” they will offer a quart of clam chowder for only $11 (to be delivered overnight or on a future date). WHERE: $1 cups of clam chowder are available at all Legal Sea Foods’ locations across the country: www.legalseafoods.com/restaurants. 0 Response to "Legal Sea Foods Declares “Chowda Day” - 1/11"